The Protocol on Water and Health specifies that in pursuing the aims of access to drinking water and provision of sanitation for everyone, special consideration should be paid to ensure equitable access to these services for all members of the population. The publication No One Left Behind: good practices to ensure equitable access to water and sanitation in the pan-European region identified three critical factors in ensuring equitable access to water and sanitation: reducing geographical disparities; overcoming the barriers faced by vulnerable and marginalized groups; and addressing affordability concerns. The Equitable Access Score-card presented in this publication builds upon these three policy concerns. It is an analytical tool designed to help Governments and other stakeholders to establish a baseline measure of the equity of access to water and sanitation, identify related priorities, discuss further actions to be taken and evaluate progress through a process of self-assessment. The publication contains recommendations on how to plan for the self-assessment and provides concrete examples of the benefits of using the score-card in different settings. 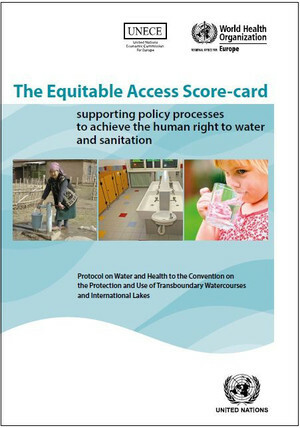 Parties to the Protocol and other stakeholders are invited to use the Equitable Access Score-card to support the definition of targets to bridge the existing gaps in access to water and sanitation and thus to achieve the human right to water and sanitation. The preparation of the publication was supported by the Ministry of Social Affairs and Health of France. Download the publication in English, French, Russian. Unofficial translations are also available in Hungarian, Macedonian, Albanian, Armenian and Azerbaijani. Download the flyer in English and Russian.